Here is a summary and overview of the Book of Ecclesiastes. The Book of Ecclesiastes, written roughly around 935 BC, comes from the Hebrew word “Qoheleth” (Koheleth) which means “preacher.” The Septuagint, the Greek version of the Old Testament, has the word Ecclesiastes as coming from “assembly.” The Book of Ecclesiastes is part of the wisdom literature of the Bible and written by King Solomon and it’s almost like an autobiography of his own life and includes all of the frustrations of life, the futility of love, but also the conclusion of all things as Solomon writes, “The end of the matter; all has been heard. 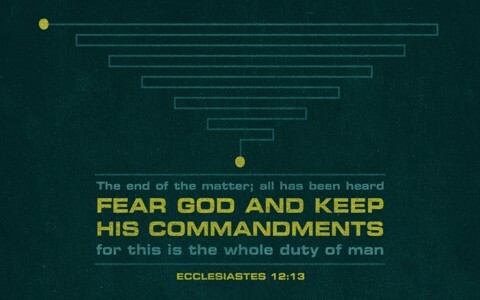 Fear God and keep his commandments, for this is the whole duty of man. For God will bring every deed into judgment, with every secret thing, whether good or evil” (Eccl 12:13-14). That is the key passage of all of the Book of Ecclesiastes. This book is about life but more importantly, the meaning of life and that is to fear the Lord God by keeping His commandments. It’s not that they save us but a saved person should desire to live an obedient life because that’s proof that we love God as the Apostle John writes, “whoever hates his brother is in the darkness and walks in the darkness, and does not know where he is going, because the darkness has blinded his eyes” (1st John 2:10) and “Whoever says “I know him” but does not keep his commandments is a liar, and the truth is not in him, but whoever keeps his word, in him truly the love of God is perfected. By this we may know that we are in him: whoever says he abides in him ought to walk in the same way in which he walked” (1st John 2:4-6). The first chapter dives right into the futility of mankind and the meaninglessness of life (apart from God). Solomon asks, “What do people gain from all their labors at which they toil under the sun” (Eccl 1:3) with the obvious answer, apart from God, nothing for we’re all headed for the grave and even with as much wisdom as Solomon had, he wrote, “with much wisdom comes much sorrow; the more knowledge, the more grief” (Eccl 1:18). He also notes that there really isn’t anything new under the sun because it’s already been done before (Eccl 1:9-10). It seems that Solomon is being very cynical in this book, even writing, “I will test you with pleasure to find out what is good.” But that also proved to be meaningless” (Eccl 1:1) and even “Laughter,” I said, “is madness. And what does pleasure accomplish” (Eccl 1:2)? Solomon had it all; wealth, possessions, fruit trees, horses, a palace, and yet, “when I surveyed all that my hands had done and what I had toiled to achieve, everything was meaningless, a chasing after the wind; nothing was gained under the sun” (Eccl 2:11). To the person who pleases God, He “gives wisdom, knowledge and happiness, but to the sinner he gives the task of gathering and storing up wealth to hand it over to the one who pleases God. This too is meaningless, a chasing after the wind” (Eccl 2:26). Solomon writes that there is a time to be born and die, a time to live and let live, a time for war and for peace, a time for laughing and for crying, and so by inference, there are times when we do these things and there are times when we should not do these things (Eccl 3:2-8). For example, we cry at a funeral but don’t laugh so for “everything there is a season, and a time for every matter under heaven” (Eccl 3:1) and even though God “has put eternity into man’s heart, yet so that he cannot find out what God has done from the beginning to the end” (Eccl 3:11). Solomon writes what we all experience at one time or another and he “saw all the oppressions that are done under the sun. And behold, the tears of the oppressed, and they had no one to comfort them! On the side of their oppressors there was power, and there was no one to comfort them” (Eccl 4:1) and “that all toil and all skill in work come from a man’s envy of his neighbor. This also is vanity and a striving after wind” (Eccl 4:4). Solomon states correctly that “Two are better than one” (Eccl 4:9) and more importantly, “a threefold cord is not quickly broken” (Eccl 4:12), which if that third cord is God, it’s not broken very easily at all! Ecclesiastes chapter five mentions that “It is better that you should not vow than that you should vow and not pay” (Eccl 5:5) which squares with what Jesus said, “Do not take an oath at all, either by heaven, for it is the throne of God or by the earth, for it is his footstool, or by Jerusalem, for it is the city of the great King” (Matt 5:34-35) which is what Jesus’ half-brother James wrote, to “let your yes” be yes and your “no” be no, so that you may not fall under condemnation” (James 5:12). Solomon writes about the fleeting nature of life as he wrote, “If a man fathers a hundred children and lives many years, so that the days of his years are many, but his soul is not satisfied with life’s good things, and he also has no burial, I say that a stillborn child is better off than he” (Eccl 6:3) and asks, “who knows what is good for man while he lives the few days of his vain life, which he passes like a shadow? For who can tell man what will be after him under the sun” (Eccl 6:12)? Solomon contrasts wisdom and folly (or foolishness) by writing, “A good name is better than precious ointment, and the day of death than the day of birth” (Eccl 6:1) and for those who yearn for the “good ole days” he says don’t ask, “Why were the former days better than these?” For it is not from wisdom that you ask this” (Eccl 7:10). Concerning wisdom, he writes, “Wisdom gives strength to the wise man more than ten rulers who are in a city” (Eccl 7:19). As we near the end of the Book of Ecclesiastes, we see a slight shift in Solomon’s writing about how when “the sentence against an evil deed is not executed speedily, the heart of the children of man is fully set to do evil. Though a sinner does evil a hundred times and prolongs his life, yet I know that it will be well with those who fear God, because they fear before him” (Eccl 8:11-2) and that “There is a vanity that takes place on earth, that there are righteous people to whom it happens according to the deeds of the wicked, and there are wicked people to whom it happens according to the deeds of the righteous. I said that this also is vanity” (Eccl 8:14). This chapter seems to emphasize that life is short, death is certain, so enjoy what God has provided for you “under the sun” with thankfulness, so “Enjoy life with the wife whom you love, all the days of your vain life that he has given you under the sun, because that is your portion in life and in your toil at which you toil under the sun” (Eccl 9:9) so by all means necessary, “Whatever your hand finds to do, do it with your might, for there is no work or thought or knowledge or wisdom in Sheol, to which you are going” (Eccl 9:10) which is much the same that the Apostle Paul wrote, “Whatever you do, work heartily, as for the Lord and not for men” (Col 3:23). You can’t bring it with you…you can enjoy it today and give it all you’ve got for it’s not for an employer but for God that you do it. There is so much wisdom packed into this chapter that it’s very similar to the Proverbs Solomon wrote. The many sage sayings include “Dead flies make the perfumer’s ointment give off a stench; so a little folly outweighs wisdom and honor” (Eccl 10:1); “calmness will lay great offenses to rest” (Eccl 10:4); “He who digs a pit will fall into it” (Eccl 10:8); and why it’s best to listen twice as often as we speak because “A fool multiplies words” (Eccl 10:14). This short chapter seems to focus on generosity as he writes, “Cast your bread upon the waters, for you will find it after many days. Give a portion to seven, or even to eight, for you know not what disaster may happen on earth” (Eccl 10:2) because Solomon later adds, “In the morning sow your seed, and at evening withhold not your hand, for you do not know which will prosper, this or that, or whether both alike will be good” (Eccl 11:6). From these two short verses we can glean that Solomon thinks there is wisdom in giving and perhaps more than just one place (“upon the waters”…”to seven, or even to eight.” This seems to refer to our giving as our storing up a reserve for when a day of disaster comes (e.g. a depression). The summary of this book comes in the very last chapter. Remember God while you’re young (Eccl 12:1), before old age sets in and the teeth give way and the eyes begin to dim (Eccl 12:3), and the hearing goes bad (Eccl 12:4). His “end of the matter [after] all has been heard” is this, “Fear God and keep his commandments, for this is the whole duty of man” (Eccl 12:13) because it’s certain that “God will bring every deed into judgment, with every secret thing, whether good or evil” (Eccl 12:14). Fearing God doesn’t mean we are terrified of being struck dead at any moment, although God is the Giver of Life and He can take it away as He pleases (Heb 9:27), but God desires that we be saved and He is well pleased when we put our trust in His Son, Jesus Christ. You don’t have to read the wisdom literature to know that every person’s duty is to believe on the Lord Jesus Christ and be saved (Acts 4:12). Otherwise, life really is meaninglessness and sheer vanity. Resource – Scripture quotations are from The Holy Bible, English Standard Version® (ESV®), copyright © 2001 by Crossway, a publishing ministry of Good News Publishers. Used by permission. All rights reserved. Photo rendered from Logos Bible Software 6.0 Visual Copy. Previous post: What Does The Olive Tree or Olive Branch Symbolize In The Bible?